Microbes of the World Blog - Do You Think With Your Gut? Do You Think With Your Gut? As you enjoy your holiday feasts, consider this: Do you think with your gut? Perhaps you do more than you realize. The intestine is lined with a complex system of nerves comprising the enteric nervous system. Nerves in the gut react to different situations, sending out serotonin and other chemical messages to the rest of your body. In the brain, serotonin helps us to learn and signals for us to rest, among other things. So, you would expect that gut serotonin also influences your general mood. In a way, your gut is acting like a second brain! And don’t forget the trillions (yes, trillions!) of bacteria that live in your gut. This microbiome also plays a role in your mood, health and overall well-being. 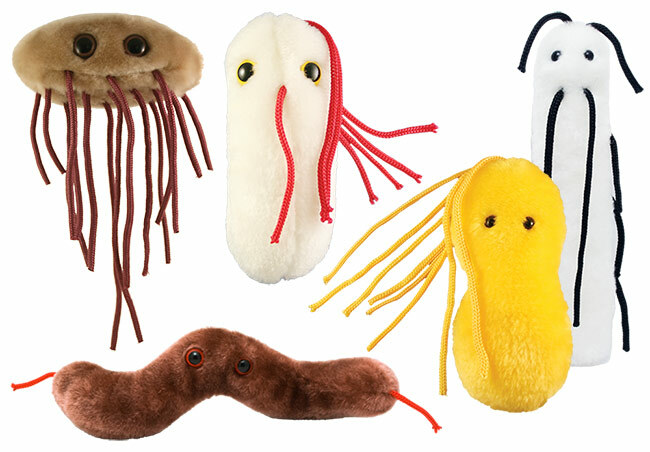 Happy gut, happy day… Happy microbes, happy life!